One of the joys of being in an MFA program like Seton Hill University’s is being able to read novels and watch films that are in the genre in which you are most interested writing. Being able to watch films like The Others is beneficial for a writer because it shows how something that seems cliché, like ghost stories, can be twisted and manipulated so that they end up being fresh. The Others is a haunted house story which I find relatively unique among films and novels involving this type of subject matter. The story begins like many other ghost stories do in that a family lives in a house alongside ghosts who disturb their everyday lives. In this particular film, the children are also plagued by a disease that forces them to stay away from light. Really, this is an obvious clue that the family will turn out to be ghosts, but it’s handled well, and it only becomes obvious, for me at least, after the twist is revealed–that is, each member of the family is a ghost, and they are the ones doing the haunting. When I had first seen the movie, which was in theaters, this had surprised me, which is one reason I enjoyed it so. I’m unsure if more observant viewers caught it beforehand, but I wasn’t one of those people. Rather, I didn’t catch any of the hints and clues that the family is dead until just before it was revealed. I think one thing the movie had going for it is it deals with a cliché topic, like I mentioned earlier. Viewers begin the movie with preconceptions about what’s bound to happen. Without the revelation this movie offers, it’s a forgettable ghost story, but with it, it’s remembered for at least long enough for it to be talked about. This is something us writers should strive for: something interesting that turns the familiar into the unfamiliar, which prompts the reader to speak with others about our stories. Something else I found effective in the film is the atmosphere that’s created. It’s dark and the children’s lives are already in danger due to their inability to be in light. Sure, there are jump scares, which is a technique that I despise, but overall the mood is set thanks to the atmosphere that not only the family lives in, but so too the viewer for the duration of the film. Anything can exist in the darkness, and with the children’s disease, it’s always dark, with only small candles burning just enough light to see the characters, yet create shadows that hide everything else. For instance, when Nicole Kidman’s character finds the old lady dressed as her daughter, the shadows hide the features of the old lady until Kidman is close enough to truly see what she looks like. In a bright environment, the light may have given away the visage of the old lady far too soon. Instead, suspense is created as the voice doesn’t quite match, then Kidman’s suspicions, followed by the accusation, and finally the full reveal. The way the scenes like these are handle are excellent, thanks in no small part to the atmosphere that’s been created. 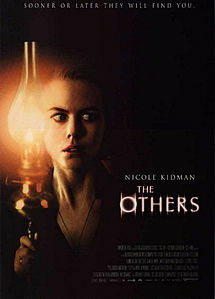 The Others is in original film framed by a clichéd topic, which I respect because it brings something new to the old.